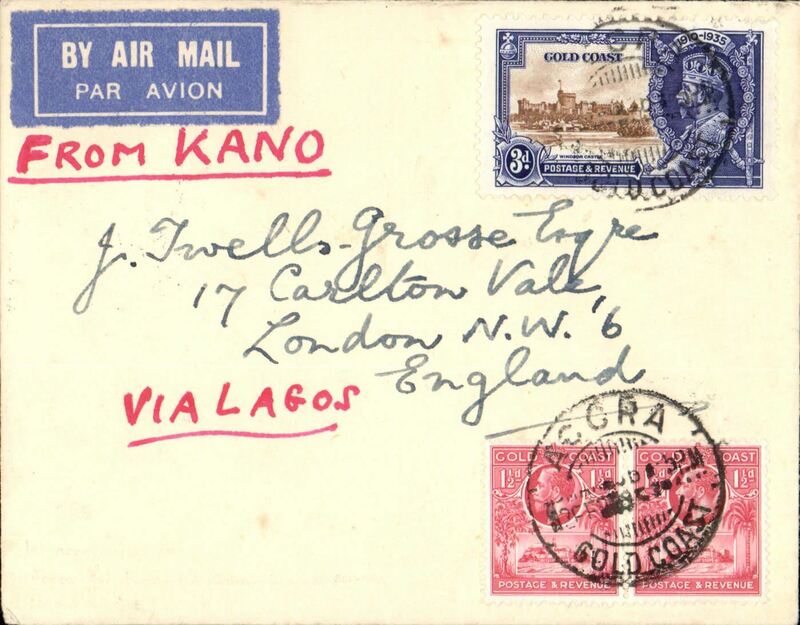 First acceptance of Gold Coast mail for London for carriage on the inaugural Kano-Khartoum leg of the West African Feeder Service, airmail etiquette cover franked Gold Coast 6d canc Accra cds, Lagos 5/3 transit cds verso, ms "From Kano/Via Lagos". A scarce and complex routing. By surface from Accra 28/2 to Lagos 5/3, by surface again to Kano where it transferred to the F/F of the Kano-Khartoum sevice (WAN 6), and finally from Khartoum-Croydon on IAW AN323. See Wingent pp 92 and 124. 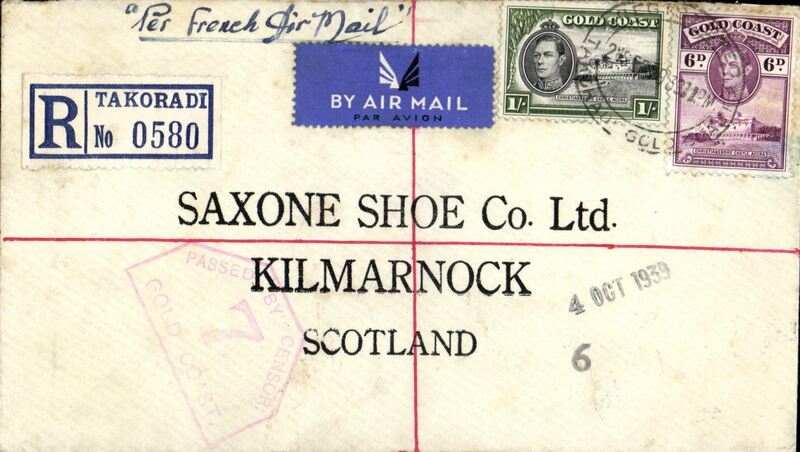 Aeromaritime/Air France, F/F cover from Gold Coast to England, Accra to London. 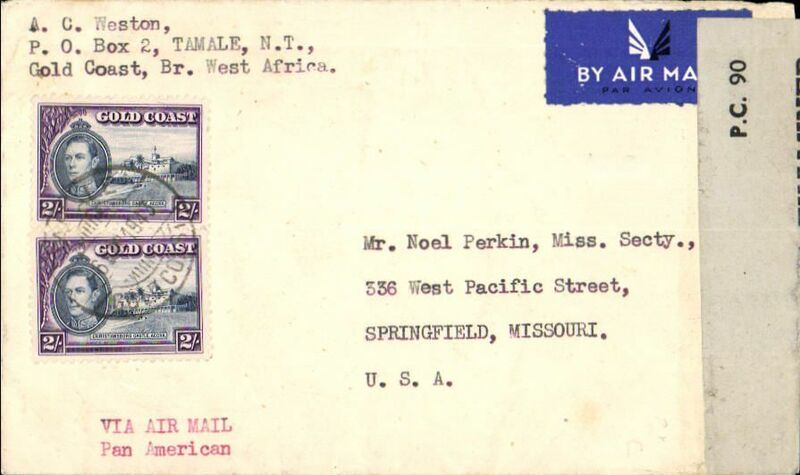 no arrival ds, via Sekondi bs 4/3, General Navigation Company corner cover franked 1/-d, canc Accra 3/3/37 cds, bright violet boxed "West Coast of Africa/ Aeromaritime/1st Voyage March 1937" cachet, carried from Takoradi-Dakar on the first return of the Dakar-Cotonau service, which linked with the Air France South America-Europe service. Although posted in Accra the cover was uploaded into a Sikorsky S38 amphibian which landed on the sea off Takoradi breakwater, on the en route for Dakar. Sekondi is only 2 miles from Takoradi. Only 7 flown on this leg. 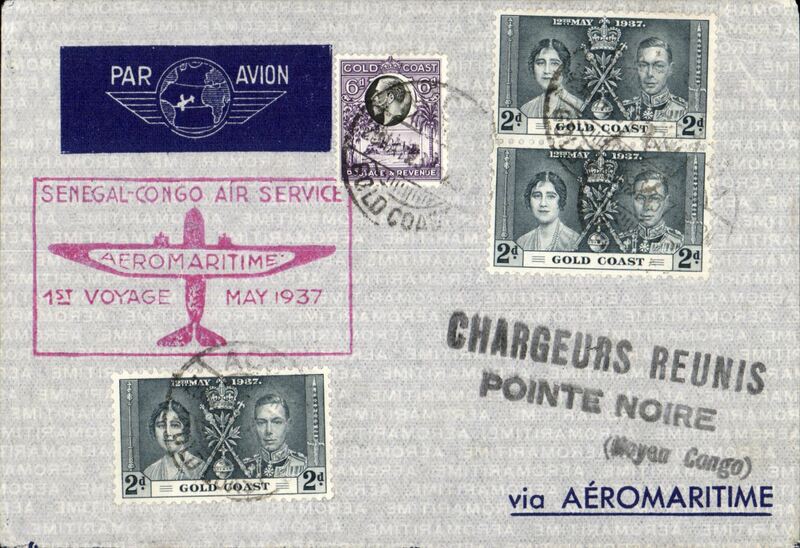 Aeromaritime/Air France, F/F cover from Gold Coast to England, via Sekondi 4/3, carried from Takoradi-Dakar on the first return of the Dakar-Cotonau service, which linked with the Air France South America-Europe service, franked 1/6d, canc Accra 3/3/37 cds, violet boxed "West Coast of Africa/ Aeromaritime/1st Voyage March 1937" cachet. Although posted in Accra the cover was uploaded into a Sikorsky S38 amphibian which landed on the sea off Takoradi breakwater, on the en route for Dakar. Sekondi is only 2 miles from Takoradi. Similar cover described and illustrated in West African Airmails, The McCaig and Porter Collections, Priddy, B., West Africa Study Circle, 2002. Only 7 flown on this leg. 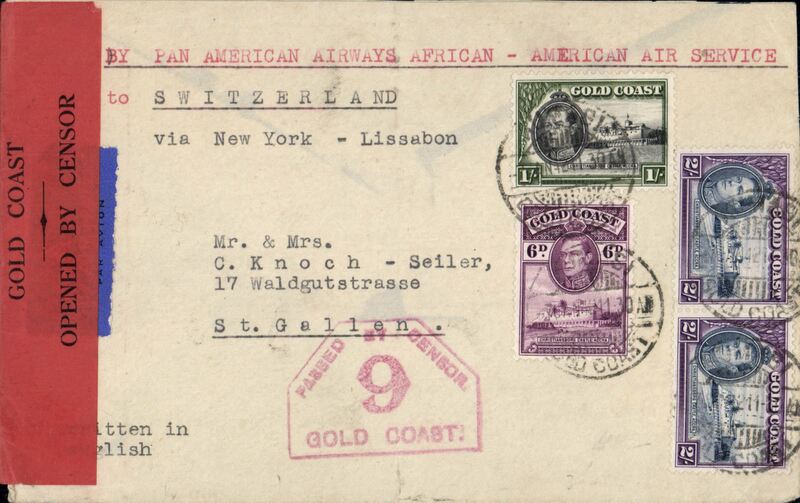 Also contains a letter from PMG Accra on with Gold Coast Colony logo confirming first regular dispatch by French Aeromaritime to Europe via Dcakar and Paris. 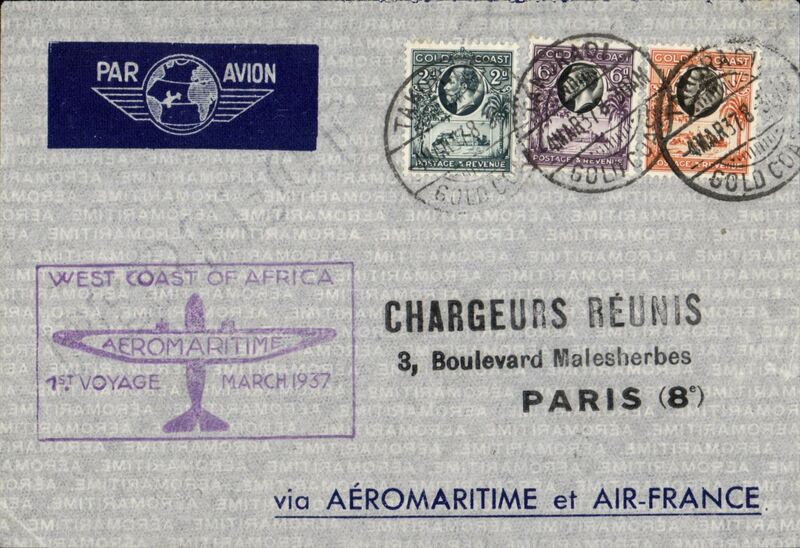 Aeromaritime/Air France, F/F cover from Gold Coast to Marseilles 11/3 via Paris 11/3, carried from Takoradi-Dakar on the first return of the Dakar-Cotonau service, which then linked with the Air France South America-Europe service, franked 1/8d, canc Takoradi 6/3/37 cds, violet boxed "West Coast of Africa/1st Voyage March 1937/ Aeromaritime" cachet. The cover was uploaded into a Sikorsky S38 amphibian which had landed on the sea off theTakoradi breakwater, en route for Dakar. A similar cover is described and illustrated on p93 West African Airmails, The McCaig and Porter Collections, Priddy, B., West Africa Study Circle, 2002. Covers from Takoradi are scarce. 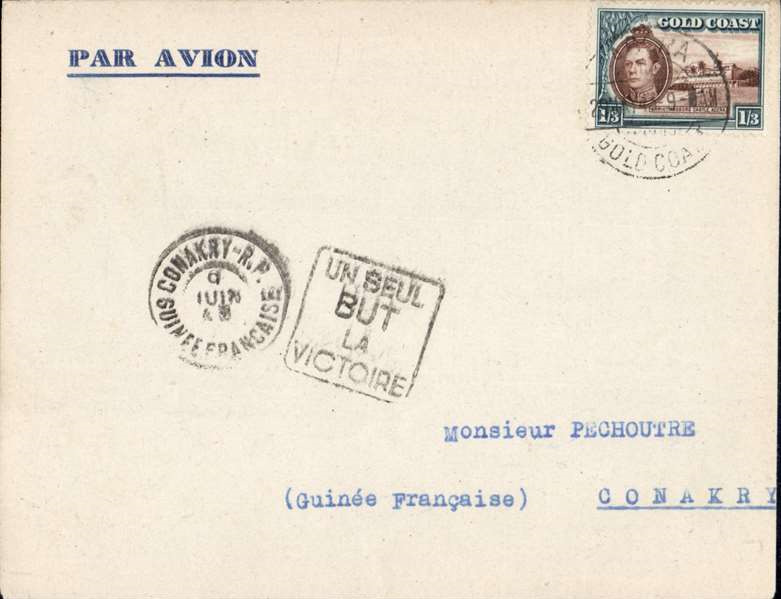 Aeromaritime/Air France, F/F cover from Gold Coast to Paris, bs 11/3, carried from Takoradi-Dakar on the first return of the Dakar-Cotonau service, which then linked with the Air France South America-Europe service, franked 1/8d, canc Takoradi 4/3/37 cds, violet boxed "West Coast of Africa/1st Voyage March 1937/ Aeromaritime" cachet. The cover was uploaded into a Sikorsky S38 amphibian which landed on the sea off Takoradi breakwater, on the en route for Dakar. A similar cover is described and illustrated on p93 West African Airmails, The McCaig and Porter Collections, Priddy, B., West Africa Study Circle, 2002. Covers from Takoradi are scarce. 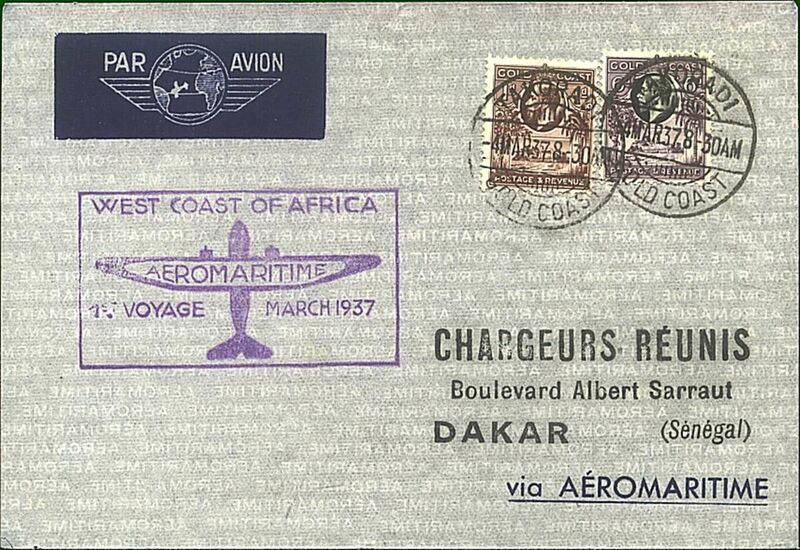 Aeromaritime/Air France, F/F Takoradi to Dakar, bs 7/3, carried on first return of the Dakar-Cotonau service, franked 6d, 1d, violet boxed "West Coast of Africa/ Aeromaritime/1st Voyage March 1937" cachet. This cover is ex Porter, album page 32, and ex McCaig #772, and is described and illustrated in West African Airmails, The McCaig and Porter Collections, Priddy, B., West Africa Study Circle, 2002. Flown by Sikorsky S38 amphibian which landed on the sea off Takoradi breakwater. Only 7 flown on this leg. Aeromaritime/Air France, F/F cover from Gold Coast to England, no arrival ds, via Sekondi bs 4/3, carried from Takoradi-Dakar on the first return of the Dakar-Cotonau service, which linked with the Air France South America-Europe service, franked 1/6d, canc Accra 3/3/37 cds, violet boxed "West Coast of Africa/ Aeromaritime/1st Voyage March 1937" cachet. Although posted in Accra the cover was uploaded into a Sikorsky S38 amphibian which landed on the sea off Takoradi breakwater, on the en route for Dakar. Sekondi is only 2 miles from Takoradi. Ex Porter, album page 32, also ex McCaig #774, and described and illustrated in West African Airmails, The McCaig and Porter Collections, Priddy, B., West Africa Study Circle, 2002. Only 7 flown on this leg. 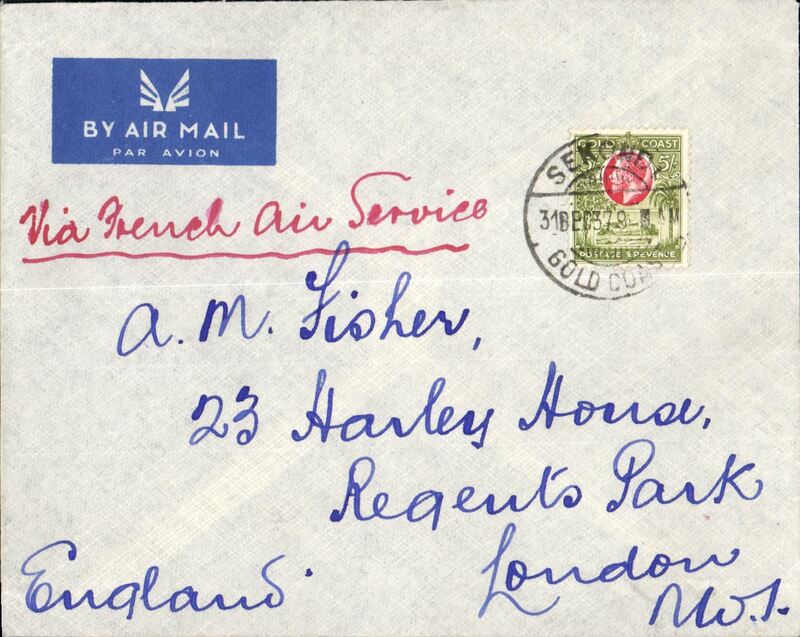 Kumasi to Liverpool, carried on the Air France regular Service, surface to Takoradi, then picked up by the French Dakar to Cotonau service, airmail etiquette cover franked 1/6d, the correct rate to the UK.correctly rated 1/6d for carriage to UK. Interesting route. Accra to Berne, first acceptance of airmail for Switzerland for carriage on the F/F Aeromaritime Dakar-Toulouse-Paris, 29/4, via Sekondi 22/4 (Sekondi is the twin city of Takoradi, airmail etiquette cover franked 1/9d carried by Aeromaritime to France via Dakar and Toulouse, violet diamond with plane cachet Scarce, as most air mail from the British Colonies in Africa was carried by Imperial Airways. Accra to London, first acceptance of airmail for GB for carriage on the F/F Aeromaritime Dakar-Toulouse-Paris service, via Sekondi 22/4 (Sekondi is the twin city of Takoradi, Airmail etiquette cover franked 1/6d carried by Aeromaritime to Paris via Dakar and Toulouse, violet framed 'By Air Mail/per French Line/Aeromaritime/from Takoradi' cachet. Minor closed flap tear verso, see scan. 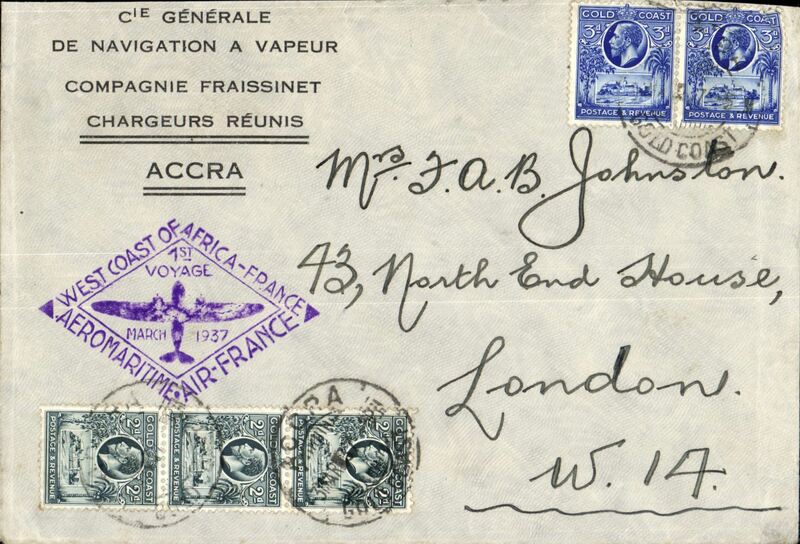 Scarce, as most air mail from the British Colonies in Africa was carried by Imperial Airways. Aeromaritime/Air France extension of the Dakar-Takoradi service to Pointe Noire (French Congo) via Lagos, Duala, Libreville and Port Gentil. 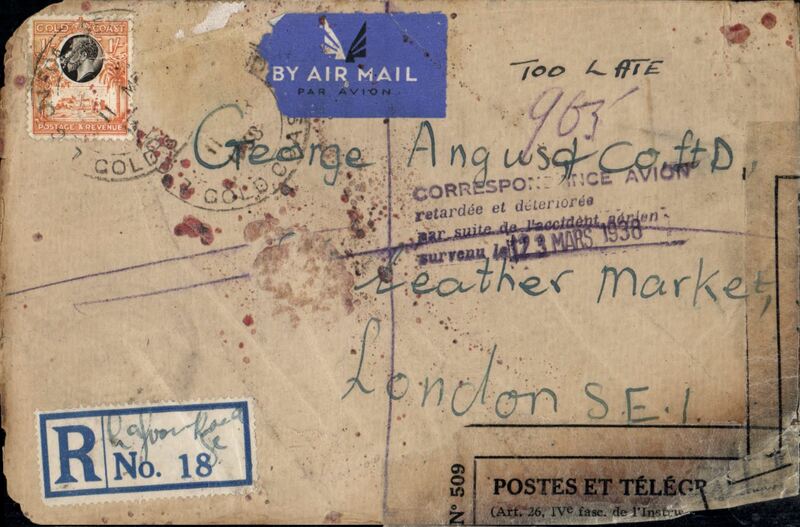 Imprint etiquette Aeromaritime cover from Gold Coast to French Congo, posted Accra 29/5, bs Pointe Noire 17/6, Sekondi 30/5 transit cds, bears red boxed F/F cachet "West Coast of Africa/ Aeromaritime/1st Voyage March 1937". Although posted in Accra the cover was uploaded into a Sikorsky S38 amphibian which landed on the sea off Takoradi breakwater - Sekondi is only 2 miles from Takoradi. According to advertisements the first outward flight of this new weekly service is understood to have reached Pointe Noire on 20/5, but this cover suggests that the first stop at Takoradi may have been one week later. See an illustration and discussion of this particular cover in McCaig's article on West African Airmails, page 2, Postal History Journal, June 1980. Also McCaig #779, and illustrated in West African Airmails, The McCaig and Porter Collections, Priddy, B., West Africa Study Circle. 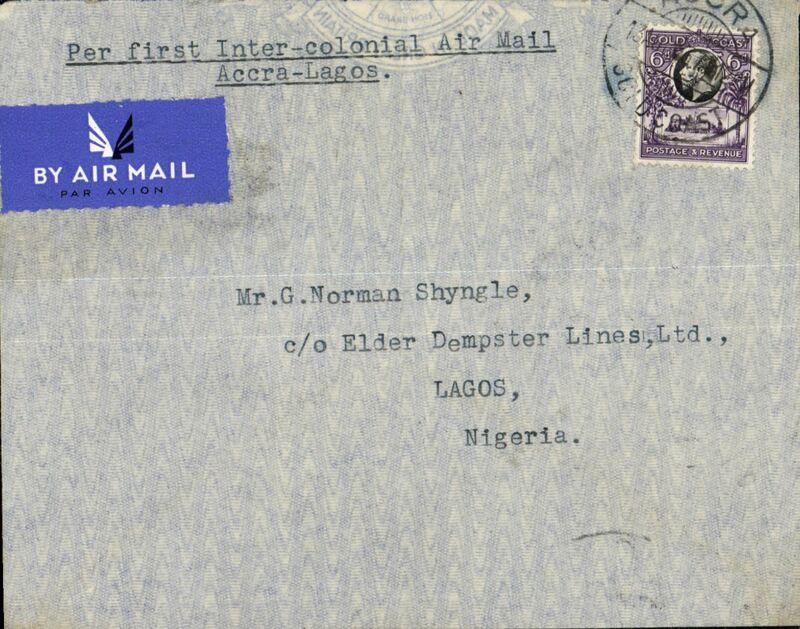 Elders Colonial Airways, experimental survey flight, Accra to Lagos, bs 14/7, pale grey airmail etiquette cover, franked 6d, canc Accra cds, typed "Per First (Experimental) Inter-Colonial Air Mail/Lagos-Accra". Official mail, but the flight was not advertised, so only a small mail was carried (ref Porter). Ex Porter, album page #35, see West African Airmails, The McCaig and Porter Collections, Priddy, B., West Africa Study Circle, 2002. 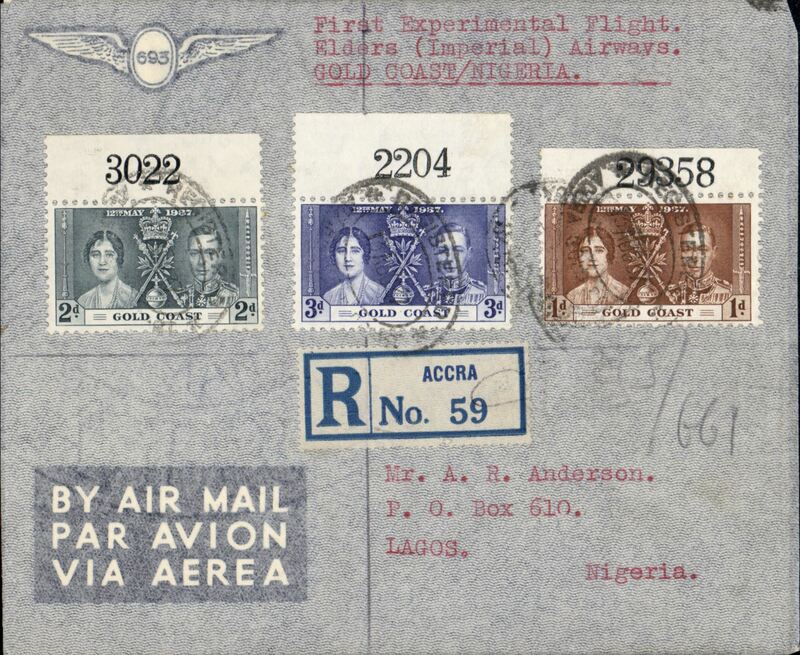 Elders Colonial Airways, experimental survey flight, Accra to Lagos, bs 14/7, registered (label) pale grey imprint etiquette cover, franked Coronation set of 3, each with control #, canc registered Accra oval ds, typed " First (Experimental) Elders (Imperial Airways/Gold Coast/Nigeria". Official mail, but the flight was not advertised, so only a small mail was carried (ref Porter). Ex Colin McCaig, #783, illustrated p102, West African Airmails, The McCaig and Porter Collections, Priddy, B., West Africa Study Circle, 2002. Francis Field authentication hs verso. 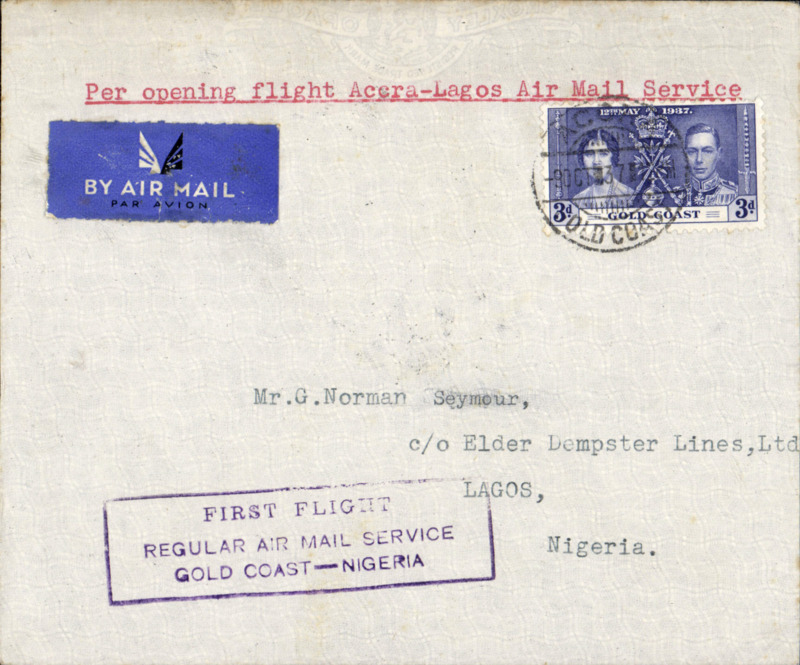 Elders Colonial Airways, experimental survey flight, Accra to Lagos, bs 14/7, pale grey airmail etiquette cover, franked 6d, canc Accra cds, typed "Per First (Experimental) Inter-Colonial Air Mail/Accra-Lagos". Official mail, but the flight was not advertised, so only a small mail was carried (ref Porter). See West African Airmails, The McCaig and Porter Collections, Priddy, B., West Africa Study Circle, 2012. 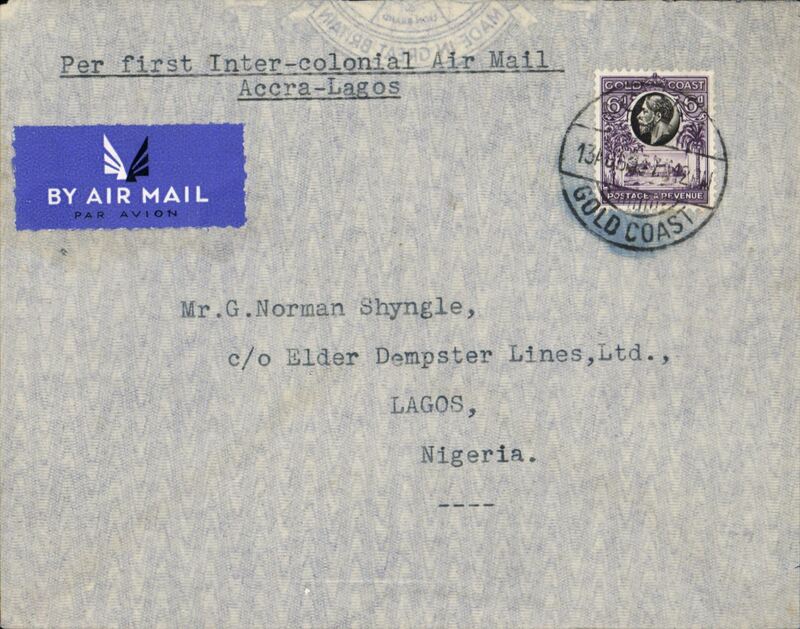 Elder Demster Feeder Service Gold Coast-Nigeria, first acceptance of Gold Coast mail for England, Takoradi to London, via Accra 7/10, flown feeder service Accra to Lagos by Elders Airways and on to London by Imperial Airways, purple "First Flight Regular Airmail Service Gold Coast Nigeria Service" cachet, no b/s, plain airmail etiquette cover franked 6d, canc Takoradi cds. Written up on album leaf with map of route. Elder Demster Feeder Service Gold Coast-Nigeria, Accra to Lagos, bs 11/10, black/grey imprint 'Air Mail' cover, franked 3d, canc Lagos cds, prple "First Flight Regular Airmail Service Gold Coast Nigeria Service" cachet, typed 'Per Opening flight Accra-Lagos Air Mail'. 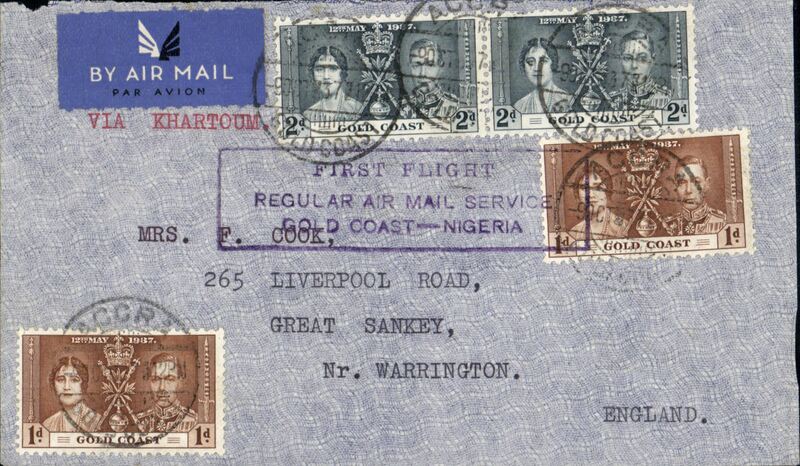 F/F Gold Coast to Nigeria and first acceptance of Gold Coast mail for England, Accra to London, flown feeder service Accra to Lagos by Elders Airways and on to London by Imperial Airways, purple "First Flight Regular Airmail Service Gold Coast Nigeria Service" cachet, typed 'Via Khartoum', no b/s, plain airmail etiquette cover franked 6d, canc Accra cds. 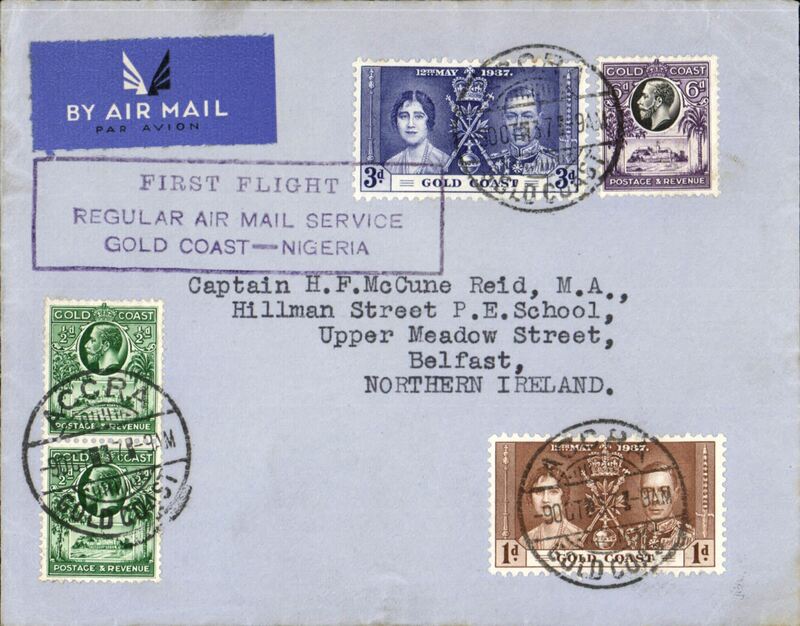 F/F Gold Coast to Nigeria and first acceptance of Gold Coast mail for Ireland, Accra to Belfast, flown feeder service Accra to Lagos by Elders Airways and on to London by Imperial Airways, 5 fine strikes purple "First Flight Regular Airmail Service Gold Coast Nigeria Service" cachet, one on the front, four verso, no b/s, plain airmail etiquette cover franked 11d, canc Accra cds. First accept for Gold Coast to London, flown feeder service Accra to Lagos by Elders Airways and on to London by Imperial Airways, purple "First Flight Regular Airmail Service Gold Coast Nigeria Service" cachet, no b/s, etiquette, cover franked Coronation set of 3 with fine black embossed "Gold Coast Colony" emblem on flap. 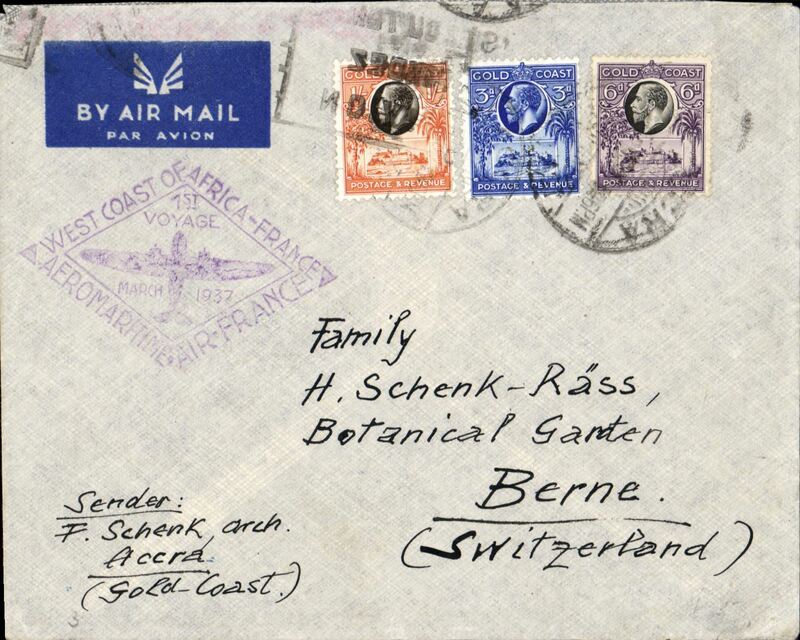 Airmail cover to England via Aeromaritime/Air France Service, Sekondi to London, no arrival ds, imprint etiquette cover franked 5/-, ms "Via French Air Services". Crash cover en route from Gold Coast to London rescued from the Air France Dewoitine 388 which crashed in the Pyrenees on its way from Dakar to Paris, Ni380323. 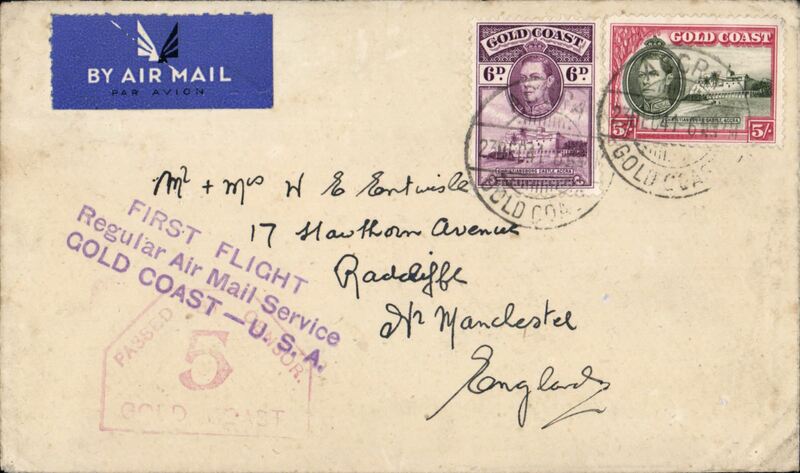 This cover is interesting, not only due to its intrinsic value as a crash cover, but also because it is a scarce example of the use of an alternative route for airmail from the Gold Coast to England. Plain registered (label) envelope franked 1/- plus ANO (likely 6d) which has been washed of, cancelled scarce 'Lagoon Road-Sekondi' cds, violet 'Correspondence Avion/Retardee et Deteriore/Par Suite L'Aident Gerien/Survenue Le' accident cachet, French 'Postes et Telegraphs' labels round the edges and few pale burn marks. Also a 'Too Late' annotation, hence the blank blue/white registration label. Likely a 'one off' Gold Coast or British West Africa item, hence the high estimate. 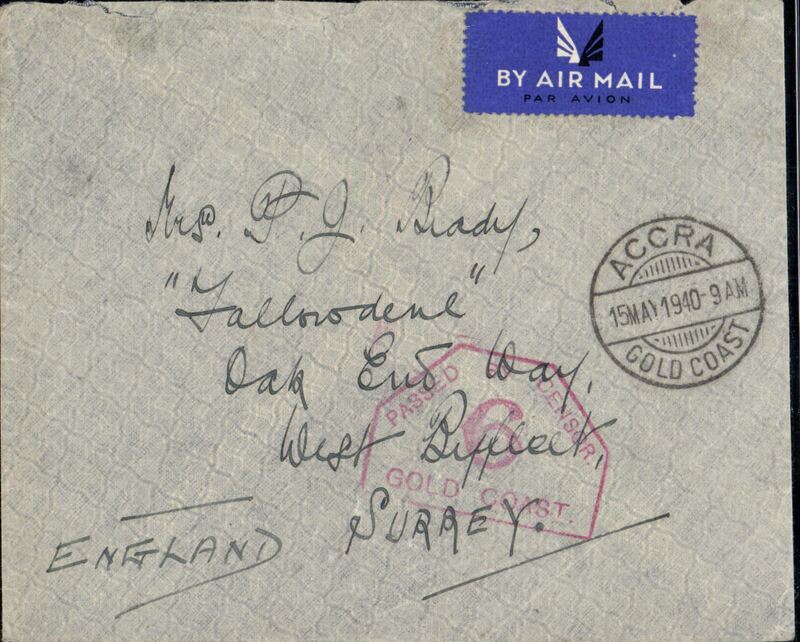 Gold Coast to Australia, Imperial Airways, Tarkwa to Perth, bs '7Jne 38', via Sekondi 1/6 and Khartoum */VI.38, plain cover franked 1/9d, red framed "Per Imperial/Air Mail" cachet. Nice item. 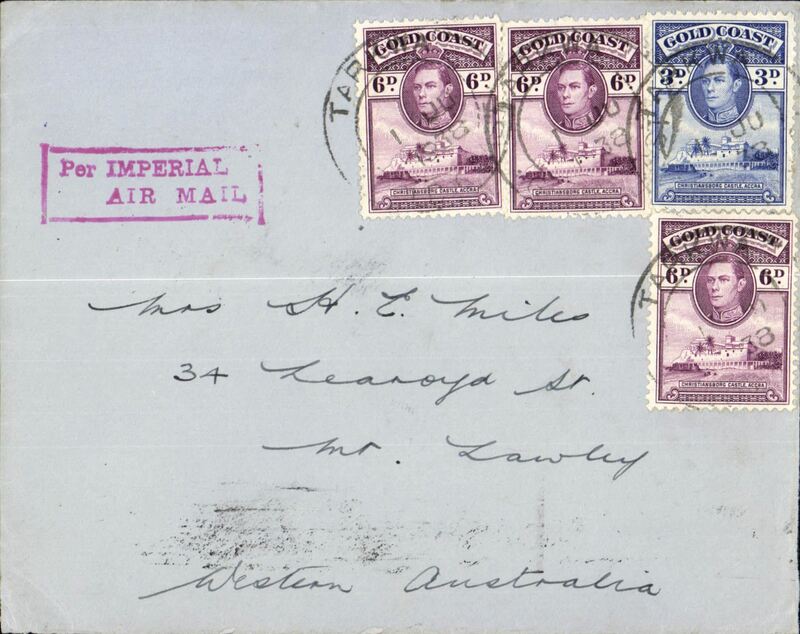 Gold Coast to Australia, Imperial Airways, Tarkwa to Perth, bs *7 Jne 38, via Sekondi 1/6 and Khartoum */VI.38, plain cover franked 1/9d, red framed "Per Imperial/Air Mail" cachet. Nice item. 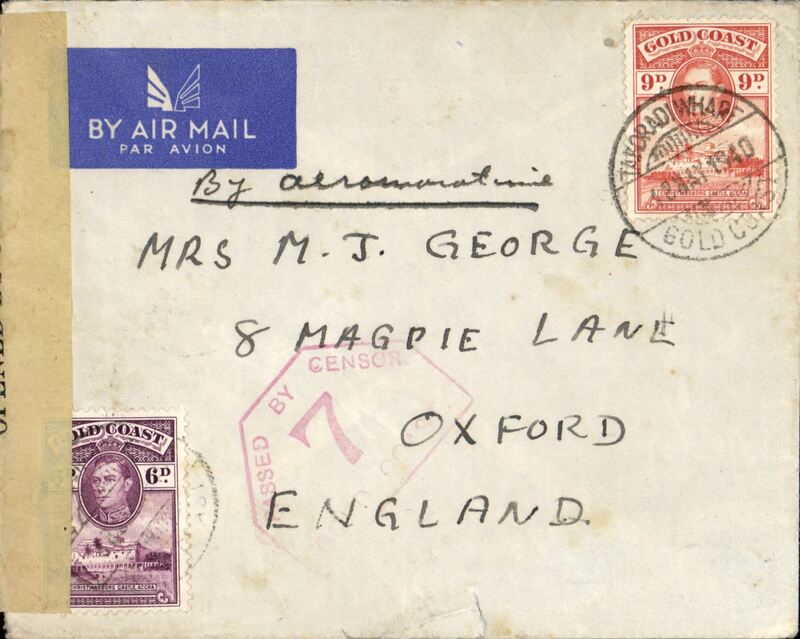 Airmail cover to England via Aeromaritime/Air France Service, Tarkwa to Oxford, no arrival ds, Accra Academy cover with shield and coat of arms on the flap, franked 1/3d, ms "French Aeromaritime/Via France'. The Accra Academy was the first private academy to be established in the Gold Coast. Elders Colonial Airways, return official trial flight, Takoradi to Lagos, no arrival ds, plain etiquette cover, typed "Per First air mail Takoradi-Lagos", franked 3d, canc incomplete Registered/ 'Takoradi' Gold Coast/5 Apr ****" dr cds. A complete strike from a similar ex Porter cover is illustrated on p113, 'West African Airmails, The McCaig and Porter Collections, Priddy, B., West Africa Study Circle, 2002', can be examined for confirmation. It was always the intention to use Takoradi as the Gold Coast terminal, but there were delays due to swamps and yellow fever and Accra was used in the meanwhile. Only 30 letters were carried on the return flight. Bears ms notation "Takoradi-Lagos/official trial flight" in Francis Field's hand. 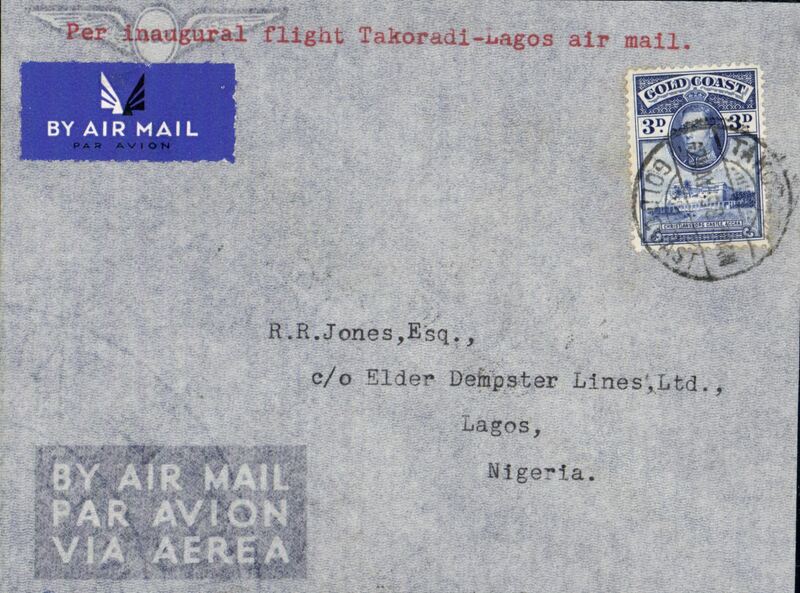 Elders Colonial Airways, return official survey flight, Takoradi to Lagos, no arrival ds, plain etiquette cover, typed "Per First air mail Takoradi-Lagos", franked 3d, canc large "Registered/ 'Takoradi' Gold Coast/5 Apr 1939" dr cds. It was always the intention to use Takoradi as the Gold Coast terminal, but there were delays due to swamps and yellow fever. Accra was used in the meanwhile. 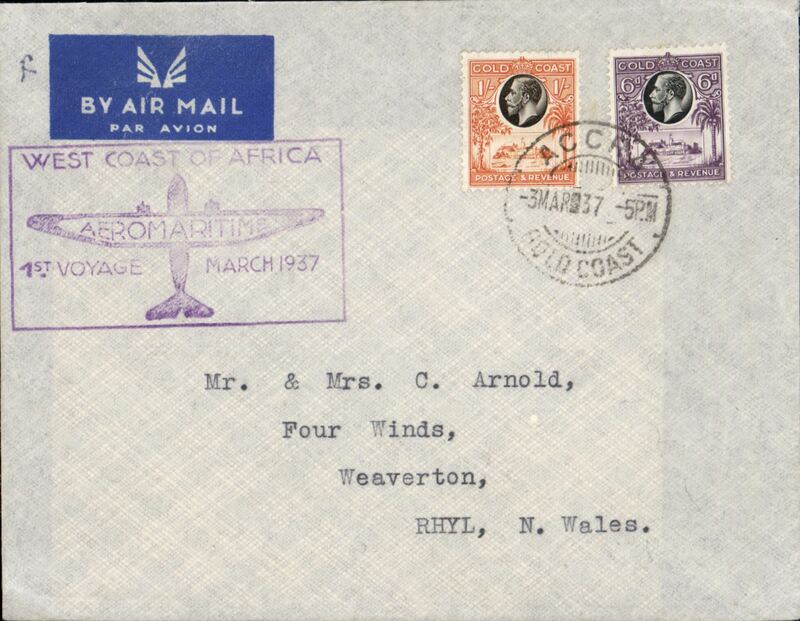 On 5/4/39 the survey flight returned from Takoradi with about 30 letters. This cover is ex Colin McCaig, #794, and is documented and illustrated p113, West African Airmails, The McCaig and Porter Collections, Priddy, B., West Africa Study Circle, 2002. 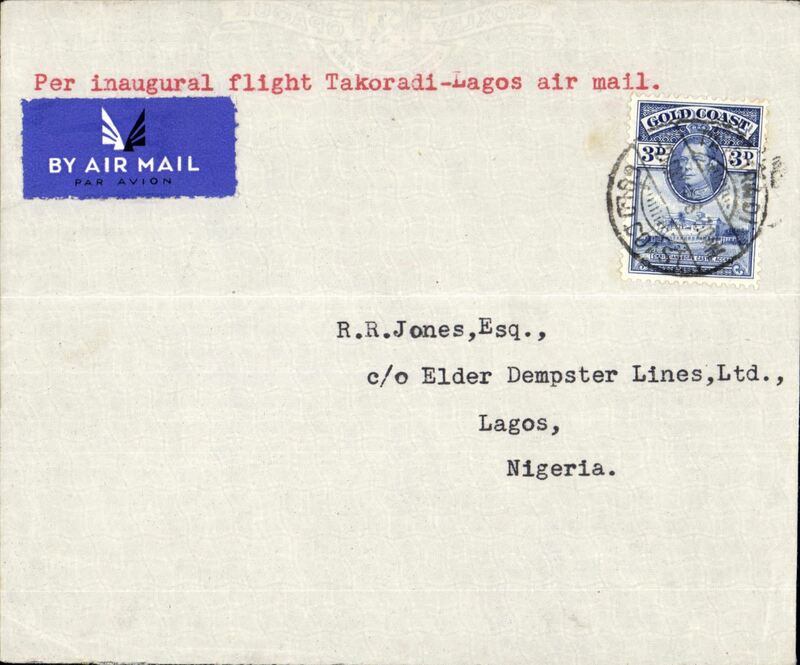 Elders Colonial Airways, first regular flight Takoradi to Lagos to Takoradi, bs 4/5, etiquette airmail cover franked 3d, canc Accra 2 May cds, typed "Per inaugural flight Takoradi-Lagos air mail", ex McCaig #796, illustrated p115 West African Airmails, The McCaig and Porter Collections, Priddy, B., West Africa Study Circle, 2002. 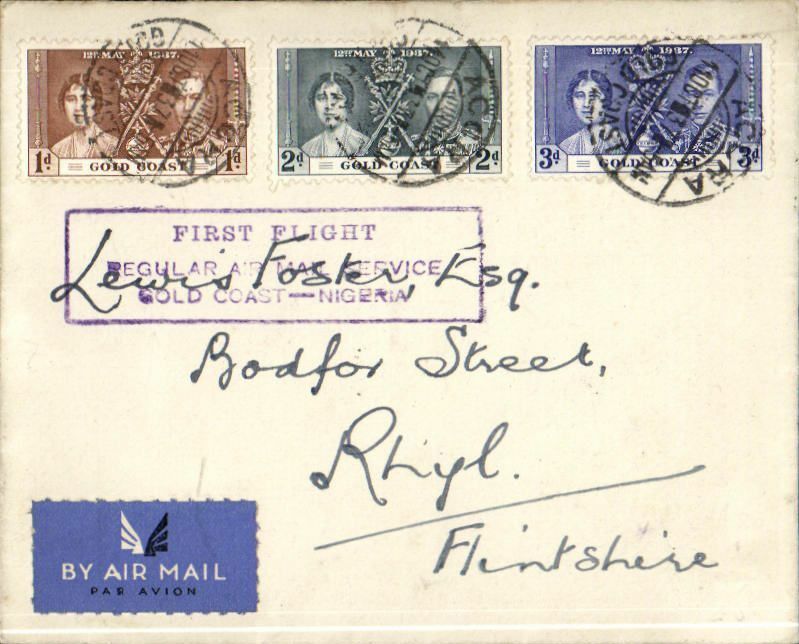 Francis Field authentication hs verso, also "1st flight regular service/Lagos-Takoradi /3 May 1939" written in hand of Francis Field. Elders Colonial Airways, first regular flight Takoradi to Lagos, bs 4/5, etiquette airmail cover franked 3d, canc Accra 2 May cds, typed "Per inaugural flight Takoradi-Lagos air mail". 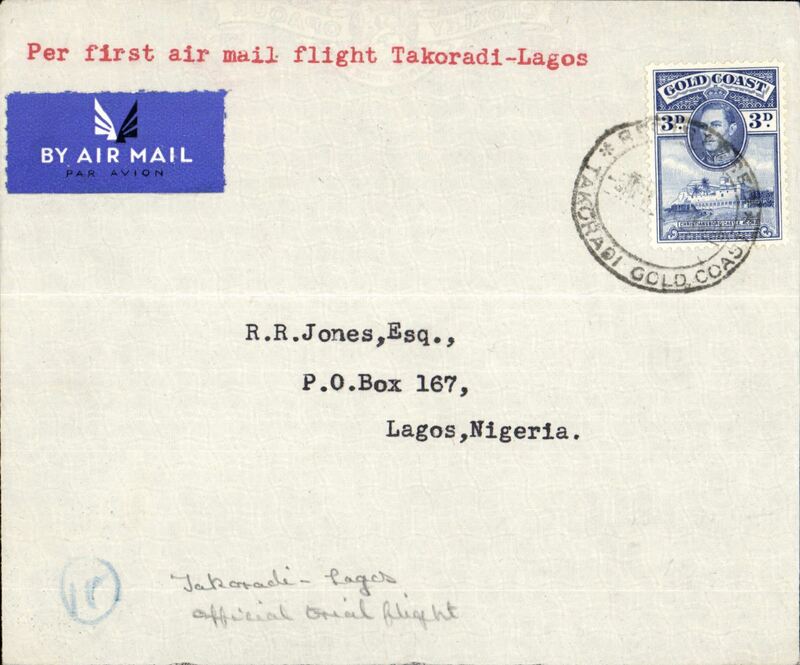 Francis Field authentication hs verso, also "1st flight regular service/Takradi-Lagos 3 May 1939" written in hand of Francis Field. Early World War II censored registered (label) airmail to England, no arrival ds, correctly rated 1/6d (1/3d for new wartime airmail rate + 3d registration), franked Asamankese cds, red hexagonal boxed "Passed By Censor/Gold Coast/6" censor mark on front. 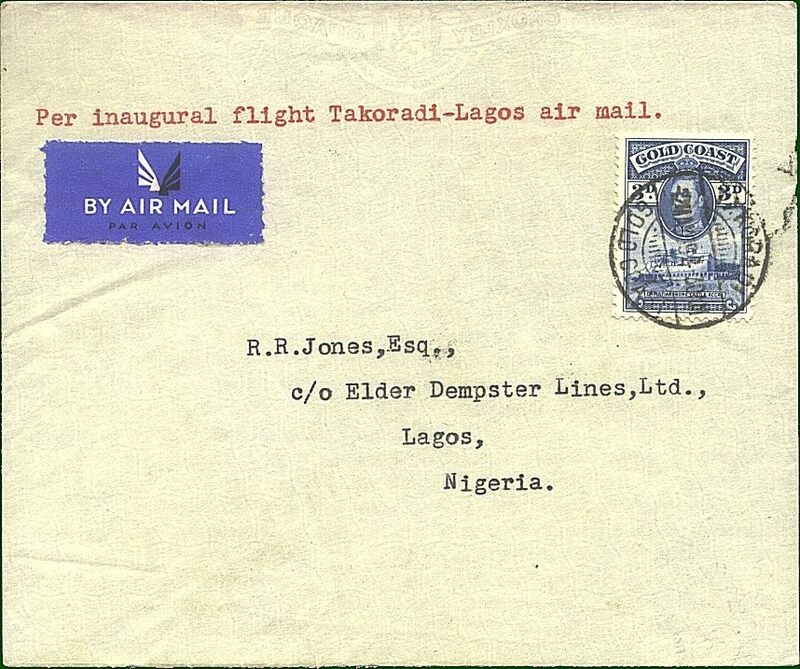 Flown on Elders AW Takoradi-Lagos service, and OAT by BOAC to destination via Khartoum, Cairo and Southampton. Uncommon origin. WWI censored airmail cover to England, franked 1/3d (1d verso), sealed black/cream Gold Coast censor tape, red "Passed by Censor/12" censor mark. Early WWII censored airmail ex Gold Coast is uncommon. Flown Takoradi-Lagos-Lagos-Khartoum-Cairo, then trans Mediterranean to England by BOAC who took over from Imperial Airways on 1/4/40. The Mediterranean route was closed to civil planes when Italy entered the war on 10/6/40. The Vichy French had suspended the BOAC route from Lagos to Khartoum at the outset of the war. 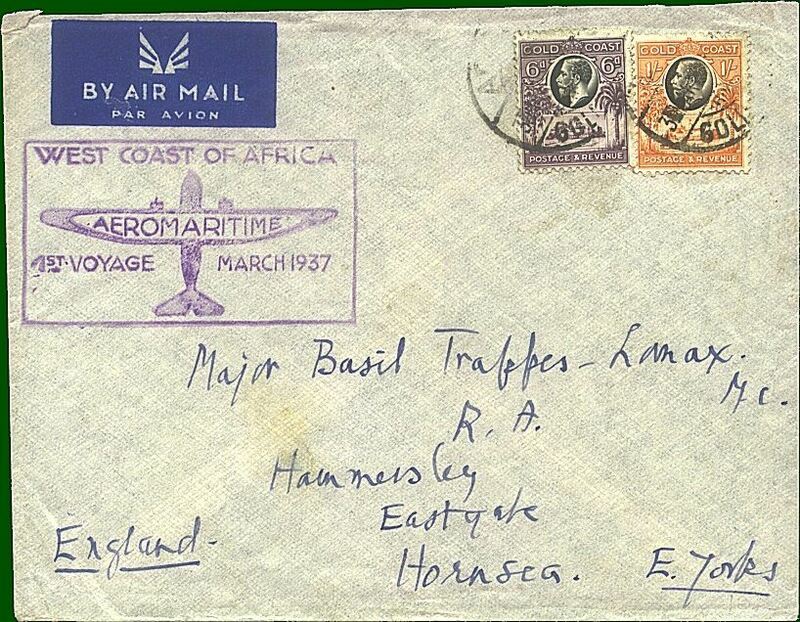 So this cover is of particular interest because it was flown over this route during a temporary interim, when the French governor of Chad gave permission for BOAC to refuel at Fort Lamy, and before the landplane route from Lagos to Khartoum was officially resumed in July 1940 (see Boyle p706). Ex McCaig. 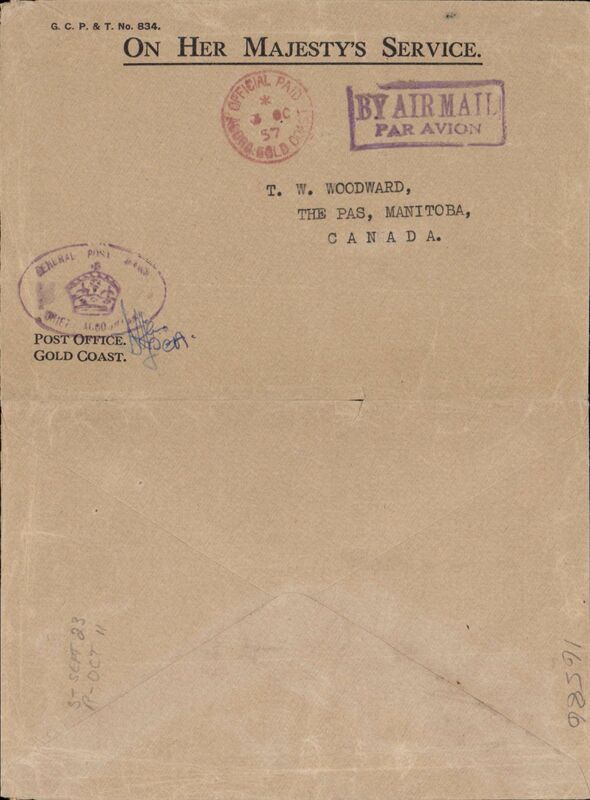 Aeromaritime, early WWII censored air cover posted in Takoradi on May 12, 1940 to England, imprint airmail etiquette cover franked 9d, canc 'Takoradi Wharf' cds, ms "By Aeromaritime", sealed by Gold Coast brown/black OBC censor tape, also red hexagonal Gold Coast #7 censor stamp. Carried on practically the last westward Aeromaritime service due to the war. From June 1940 only eastbound mail was accepted. 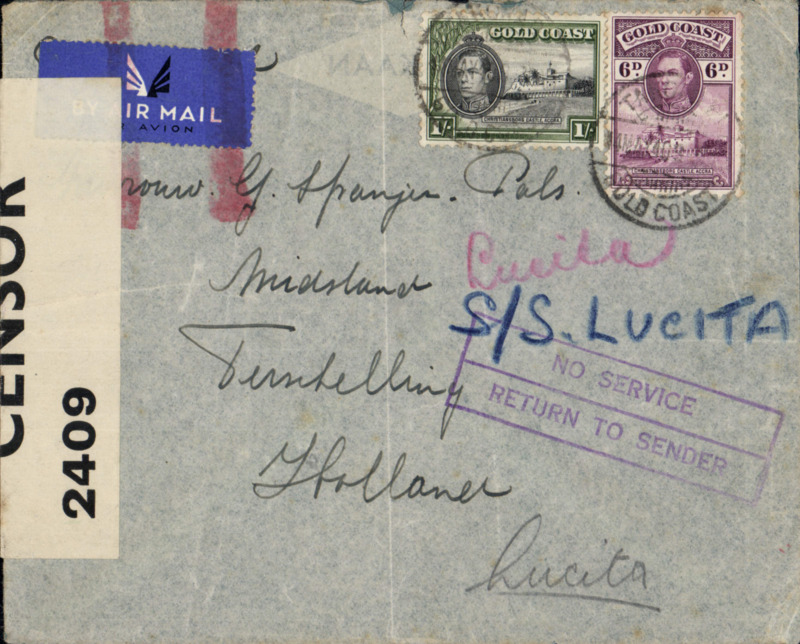 Early WWII censored air cover posted in Takoradi on May 14, 1940 to Holland, airmail etiquette cover franked 1/6d, ms 'S.S Lucita', hand stamp verso 'Dispatched/ 14th May 1940/ Ed Lines LTM/Takoradi' in a timestamp, sealed GB PC90 OBC 2409 censor tape. 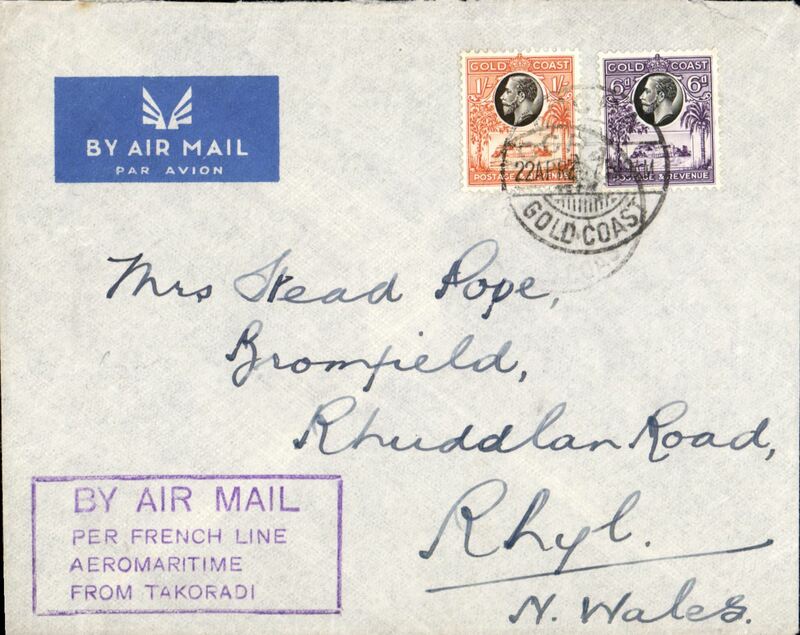 This cover reached London, where the airmail etiquette was cancelled with two red bar Jusqu'a. A violet framed "No Service/Return to Sender" hand stamp was also applied due to suspension of the onward airmail service to Holland on May 15, 1949 following the surrender of the Dutch to the invading Germans. A nice WWII item. 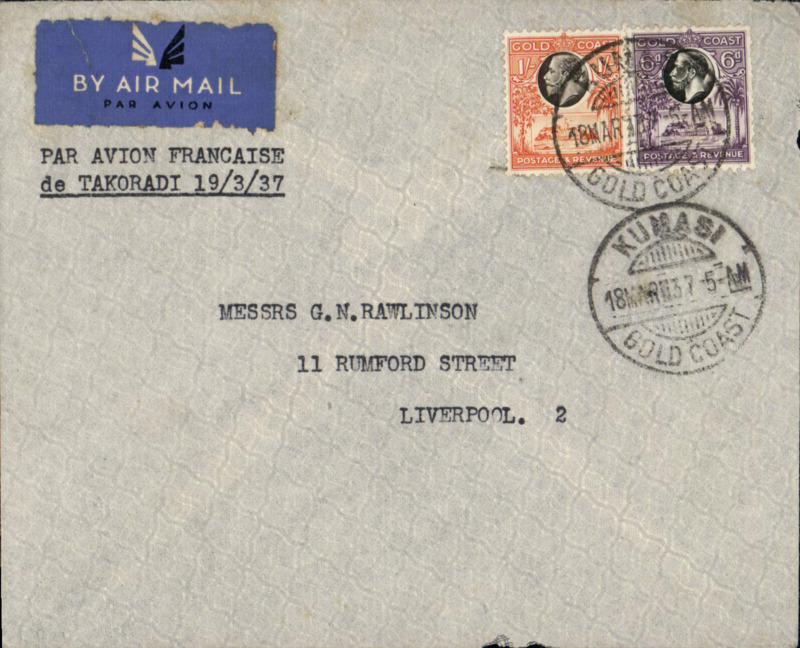 Early WWII airmail cover posted in Accra on May 15, 1940 to England, franked 1/3d verso, red hexagonal 'Passed by Censor/6/Gold Coast' censor mark. Correctly rated 1/3d for carriage by BOAC via Khartoum and Cairo, or Aeromaritime/Air France via Dakar and Paris. Both these services terminated when Italy entered the war in June 1940. 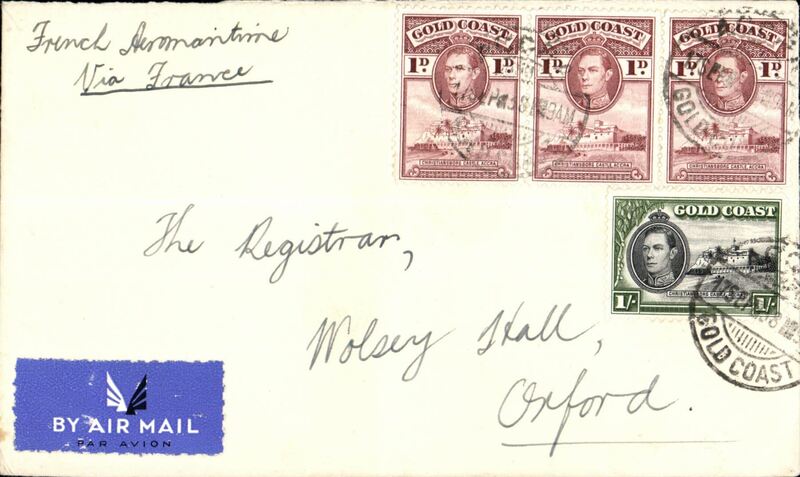 Early World War II censored air cover to England, no arrival ds, correctly franked 1/3d for new wartime airmail rate, postmarked Accra/Gold Coast cds, red pentagonal boxed "Passed By Censor/Gold Coast/6" censor mark on front. Italy entered the war on 10/6/40 and closed the Mediterranean to civil planes, so this cover was one of the last to be flown on the trans Mediterranean to England service. Carried Accra-Lagos in DH86 'Dione' on flight TL59 by Elders Colonial Airways, then to Khartoum in DH86 'Diane' on BOAC flight LK 225, then on the BOAC DN 271 flying boat service to Alexandria in flying boat 'Corsair', and on to Poole in flying boat 'Corio'. This was 'Corsair's first northbound service since being rescued from its crash in the Congo some 12 months earlier. Nice item. 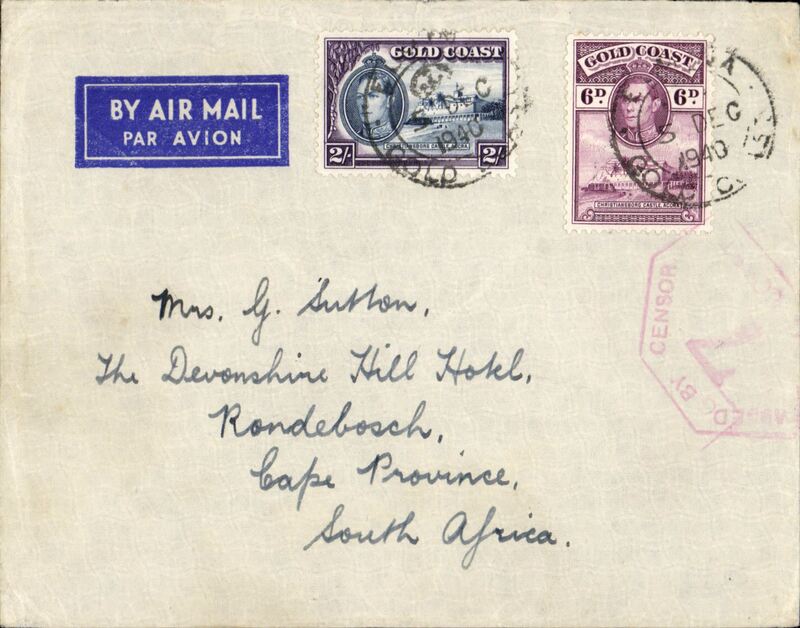 Early World War II censored printed Air Mail/Par Avion double rate cover to South Africa, no arrival ds, franked 2/6d (2x the new wartime airmail rate of 1/3d), franked Accra cds, red pentagonal boxed "Passed By Censor/Gold Coast/7" censor mark on front. Flown by BOAC over the land plane route from Lagos to Khartoum (which had been officially resumed in July 1940 following temporary closure when Italy entered the war in June 1940, see Boyle p706). At Khartoum it was transferred to the flying boat service to South Africa. 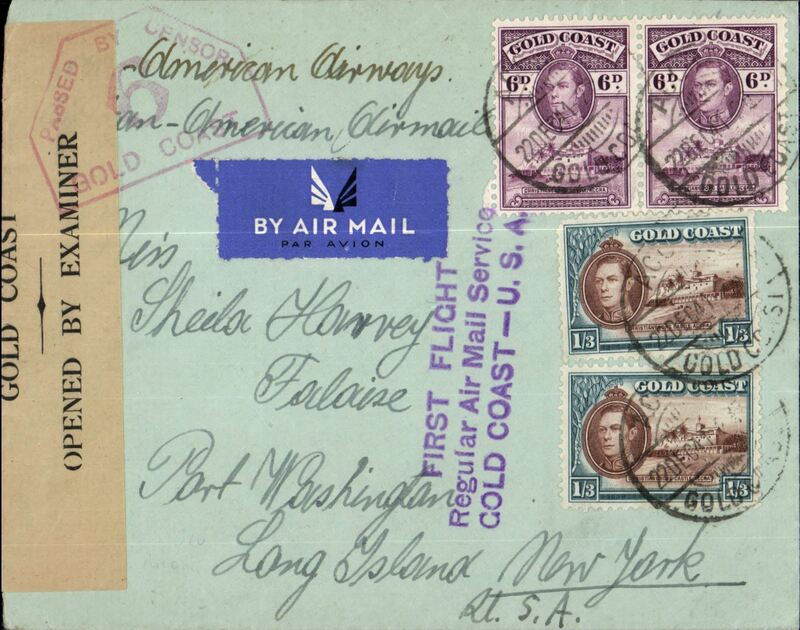 Early WWII censored airmail ex Gold Coast is uncommon. Nice item. American Air mail Service, F/F Gold Coast to England via the all air Pan Am FAM 22 West Africa-Brazil-Miami-Lagos-Bathurst service, Accra to Manchester, plain etiquette cover, correctly rated 5/6d for Gold Coast-UK mail, fine strike violet three line "First Flight/Regular Air Mail Service/GOLD COAST-USA" flight cachet, red hexagonal PBC/5/Gold Coast censor mark. Carried by Pan Am 'all the way', first E-W on the new FAM 22 service, then W-E to Lisbon on FAM 18, then BOAC/KLM to London. Crossed the Atlantic twice by air, service discontinued in March 1942. Super wartime item. Image. 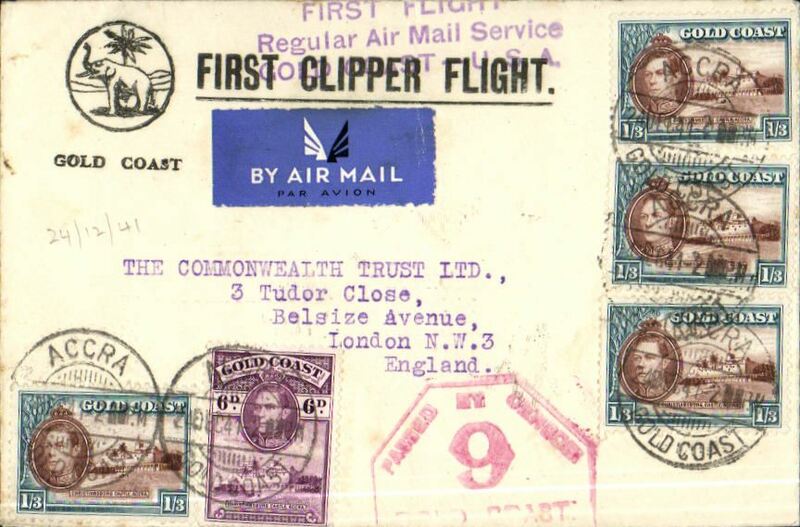 American Air mail Service, F/F Gold Coast to England via the all air Pan Am FAM 22 West Africa-Brazil-Miami-Lagos-Bathurst service, Accra to London, no arrival ds, 'Elephant & Palm' and 'First Clipper Flight' printed cover correctly rated 5/6d for Gold Coast-UK mail, fine strike violet three line "First Flight/Regular Air Mail Service/GOLD COAST-USA" flight cachet, red hexagonal PBC/9/Gold Coast censor mark. Carried by Pan Am 'all the way', first E-W on the new FAM 22 service, then W-E to Lisbon on FAM 18, then BOAC/KLM to London. Crossed the Atlantic twice by air, service discontinued in March 1942. Super wartime item, illustrated p135, West African Airmails, The McCaig and Porter Collections, Priddy, B., West Africa Study Circle, 2002. WWII censored F/F, Gold Coast to USA via the all air Pan Am FAM 22 West Africa-Brazil-Miami service, Accra to New York, plain airmail etiquette cover, correctly rated 3/6d for Gold Coast-US mail, ms "Pan-American Air Mail", fine strike violet three line "First Flight/Regular Air Mail Service/GOLD COAST-USA" flight cachet, sealed buff/black 'Gold Coast/OBE' censor tape tied by red hexagonal PBC/9/Gold Coast censor mark. Carried by Pan Am to Miami, then US internal air service to final destination. A nice wartime item. 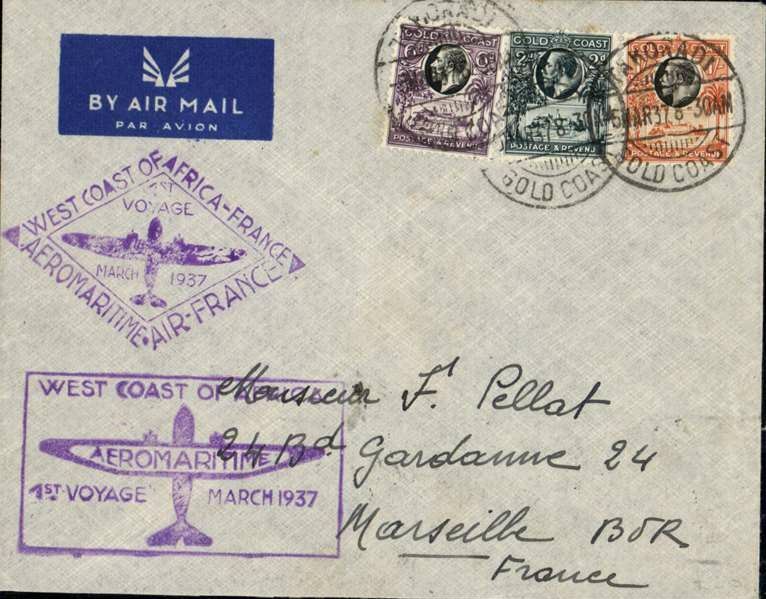 World War II airmail, F/F Accra to Conkary, 9/6 arrival ds on front, carried on the resumed Aeromaritime French Guinea-Lagos service, printed' Par Avion' corner cover, franked 1/3d, canc Accra cds, black boxed "Un Seul/But/La/Victoire" cachet. Mail on the outward flight left Conakry on 21/5 and called at Accra on 23/5 and reached Lagos on 25/5. A super wartime item. A similar item is illustrated on p138, of West African Airmails,The McCaig and Porter Collections, Priddy, B., West Africa Study Circle, 2002. World War II censored airmail cover, Tamale to Springfield, Mass, no arrival ds, franked 4/-, fine strike red two line "Via Air Mail/Pan American", sealed Gold Coast grey/black PC90 0035 censor tape. Carried by the Pan Am North Atlantic airmail service, see Boyle p719. World War II censored air cover to Switzerland, plain cover franked 5/6d, typed "African/American Air Service to Switzerland/via New Yo", sealed with red/black "Passed by Censor/5/Gold Coast" censor tape, also red hexagonal ''PBC/9/Gold Coast' censor mark. Correctly rated for the "twice across the Atlantic" route - FAM22 to New York, then Pan Am back to Lisbon, then KLM/BOAC to London, see Boyle p709. A nice TransPacific and TransAtlantic item. Flown stampless printed OHMS/Post Office Gold Coast cover, Accra to Manitoba, ms received 11/10 verso, red "Official Paid/3 Oct 57/Accra Gold Coast" cds, boxed violet two line 'By Airmail/Par Avion' hs, also oval violet "General Post Office/Chief Accountant" hs with crown inside over signed by the Chief Accountant. Gold Coast became Ghana on 1/3/57. Unusual airmail item.